Tufo was founded in 1991, based on more than 25 years of experience in rubber tyre industry and was founded by Mr Miloslav Klabal. 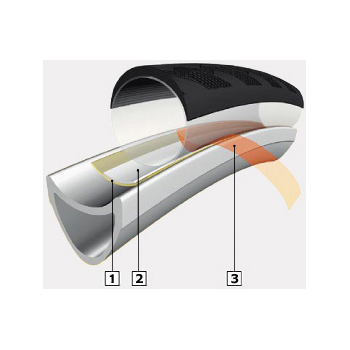 The basic philosophy of the company is specialisation in the development and production of tubular tyres – the best option for cycling. From the very beginning Tufo has worked hand-hand with many world champions and elite riders from all cycling disciplines. This cooperation makes the transition of theoretical knowledge from development and research into new products much easier. The top priority from Tufo is the quality of their products, therefore all the production is under direct and everyday control in the Tufo plant in the Czech republic. Most of the production is accomplished by skilled handwork making it possible to concentrate on details which is very important to achieving maximum quality. Just the one wheel. Personally I use the tape for road side tyre replacement and the glue at home. Yes this will do the job. Off-road version (for 26&quot; wheels) will be too short.